After standing outside in the cold for 2 hours watching the Santa Claus parade with my daughter, she looked up at me, red nose and all, and said, "I loved the parade. It was fun." I'll forget my frozen fingers and toes but that will stay with me forever. Making memories with my girl is one of the highlights of motherhood for me. Today is the final day for Children's Book Week. There are so many books I want to share with my daughter as she grows older. I thought I'd share my list with you all. I know it's a girly-girly list but, hey, I'm a girly-girl. The Endless Steppe This story has stuck with me since my parents gave it to me for Christmas in my Pre-teens. Esther's struggles as a young girl in a Russian interment camp revealed to me how lucky I am. I still remember her disastrous attempt at washing her hair. Little Women The first 'real' book I ever read. Another Christmas gift. I didn't have any sisters but if I did I'd want them to be like the March clan- with me as Jo, of course. Hei di I still have the copy my Grandmother gave me. I loved this story of a little girl living with her Grandfather in the Swiss Alps. 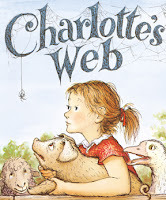 Charlo tte's Web I was never a fan of spiders, still not, but a spider helping a pig is a great story for kids. Anne of Green Gables After reading Anne, I wanted red hair and freckles, or at least be her friend Diana. I can't wait to share this Canadian classic with my daughter. Nancy D rew Yes, they're terribly old fashioned and predictable, but I thought Nancy's adventures were great fun in my younger years. Whether you have kids or not, what books would you share with a child? Sadly I don't remember most of those, although I know I read them. My memory is horrible. I'm trying - gasp - to get my son into superhero comics. He's six and struggling to read; I'm trying to get his attention focused on something he finds interesting. I want him to read other books TOO but this is a good start I think. Little Women and Heida are great books.. especially for girls. when my sons were young they loved Willie Wonka. Winnie the Pooh and the Moomins were the biggest successes, I think. My sons weren't great readers once I stopped reading to them, but they liked audio books. My younger son loved the film of Watership Down, he watched it all the time. I have two sons, but I read Little Women and Anne of Green Gables just to see what I was missing. I'm so glad that I did. (Note: I do have red hair and freckles, so I suppose Anne made me wish I were a girl.) I also read a more recent book that my niece, now almost twenty, has re-read countless times since she was ten: Gail Carson Levine's Ella Enchanted. It was the only childhood book that she took to college with her. It's lovely. I went nuts looking for a book I loved as a kid so I could share it with my 10 year old daughter. It's called EMMY KEEPS A PROMISE by Madye Lee Chastain, and I finally found it through a used bookstore since it's out of print. It's the story of Emmy and her older sister Arabel who move to New York City so Arabel can teach at a swanky girls school (in the 1800s) and they end up getting befriended by a rich family who takes them under their wing. It's a wonderful story. I read The Bobbsey Twins instead of Nancy Drew. I always recommend Bruno and Boots books, by Gordon Korman, and are the books that got my son hooked on reading. Hi! I know all of these except The Endless Steppe, which sounds very good. I am looking forward to sharing the Beverly Cleary books and The All of a Kind Family books, especially. Erin- Anything that gets them interested is a good thing. Kailana- I haven't read the Emily books. I'll have to put them on the list. I remember reading horse books too. Black Beauty, maybe? Deslily- I never did read Willy Wonka. Cat- My kid never took to Pooh. Funny. I loved the film Watership Down too. So sad. Rob- I saw the movie. I didn't know it was a book. I'll have to look for it. Karen- I've never heard of that one. That reminds me though- I told my girl about a book I loved as a little kid "Henry's Awful Mistake". I looked online and it was out of print. The library had a book sale and in the pile of beaten up old books was "Henry's Awful Mistake". So of course I bought it! Raidergirl- I had forgotten about some of those but I read a lot of them. Loved "Fried Worms". Tara- "The Endless Steppe" is one of those lesser known gems. Loved the Cleary books too. Hey, Charlotte's Web's not a girly girl book! Favourites of mine included the Bunnicula series. I grew up hating to read. 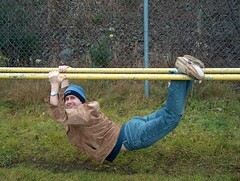 Now I write action-adventures & mysteries especially for boys 8 - 13, who also may not like to read. NEWSPAPER CAPER, TERROR AT WOLF LAKE, NORTH WOODS POACHERS, MOUNTAIN CABIN MYSTERY, BIG RIG RUSTLERS, SECRET OF ABBOTT'S CAVE & LEGEND OF THE WHITE WOLF, are compared by readers and reviewers to Tom Sawyer, The Hardy Boys, Huck Finn, Nancy Drew, Tom Swift, Scooby-Doo, Lemony Snicket, and adventure author Jack London. My blog, Books for Boys, ranks in the top 5 on Yahoo and the top 20 on Google and you can find it at http://booksandboys.blogspot.com There you will also find links to my author's web site and another blog with 50 pages of reviews. Now, from an author who hated to read...comes books kids hate to put down. Those are the ones that jump immediately to mind. Those are great books. I can remember my son coming home from school with a book I had loved as a child. I think I was more excited than he was. 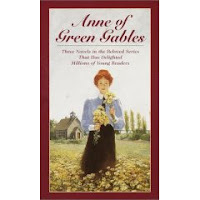 I can't wait to share the Little House on the Prairie and the Anne of Green Gable books with my future daughter!